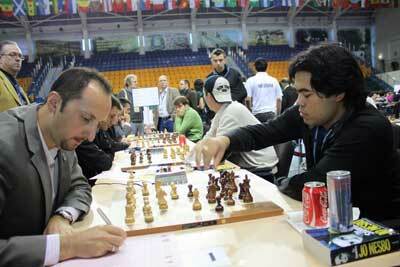 The US team defeated Bulgaria today as the Chess Olympiad in Khanty-Mansiysk approaches its finale. 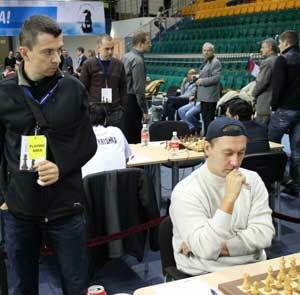 Our US Champion Gata Kamsky scored the clutch victory over Ivan Cheparinov. Ukraine currently leads the Olympiad, with Russia 1 and France right behind. The US is tied for 4th-6th with Israel and China. Tomorrow, we face Israel in the crucial penultimate match. Nakamura drew with Black against the #2 ranked player in the World, Veselin Topalov (2803). The women tied with Greece. On board four, Kamile Baginskaite won a nice game, while Anna Zatonskih and Tatev Abrahamyan drew on boards two and three. Irina Krush had a better endgame against Yelena Dembo, but her king unexpectedly got caught in a net, to give Greece the tied point. Russia 1 currently leads the Women's Olympiad by a wide margin. The US are tied for 11th-21st and will hope to win their final two matches to jump the standings.